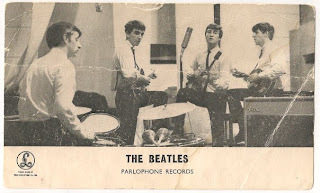 This is an extremely early Parlophone promotional card for The Beatles, featuring an image from their first recording session. Some of the very early promotional cards are rare and this one is signed on the reverse! However it is signed by only one Beatle! 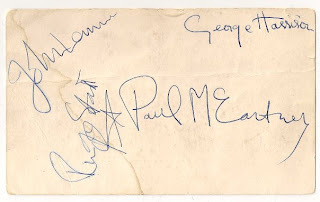 As often happened one band member, in this case George Harrison, has signed his own name and then copied the signatures of the others.